Applications Hot water boiler, heat exchangers and generators. Extra heavy construction helps provide long life. Top guided disc assembly incorporates resilient seal in seating area. An isolating diaphragm protects working parts from corrosion caused by discharged liquid. Pivot between disc and spring designed to correct for misalignment and compensates for spring side thrust. 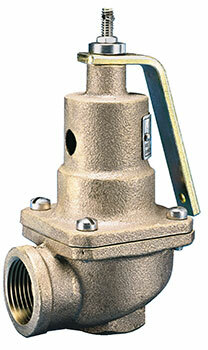 These safety relief valves serve the dual purpose of relieving (1) overpressure created by thermal expansion under normal "on" and "off" firing conditions, and (2) overpressure in the form of water or steam created in over-firing due to failure of electrical or other controls.